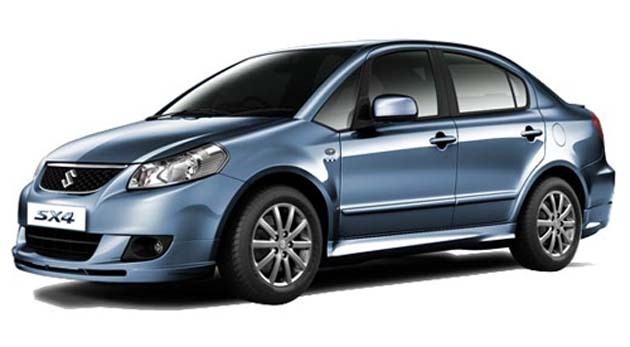 The Maruti Suzuki SX4 in India or for that matter, anywhere else in the world looks butch. It is actually a crossover sedan which has got an SUV stance as well as height whereas its other features suggest that it is a sedan. 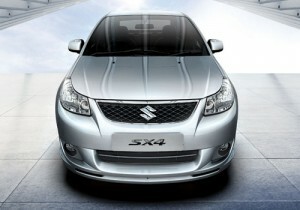 It has got that very Swift like grille with the Suzuki logo on it. The Maruti logo, after the 800 and Esteem now seems redundant. The head lamps are of the peeled back design and the area around the grille looks like the one from the Mitsubishi Cedia’s. The side profile at the same time brings in 16 inch wheels with a new multi spoke design. I definitely loved the old design of alloy wheels which were similar to the ones in the first generation Toyota Corolla in India. The quarter glass at the front as well as at the rear door enhance the look of this car. I am sure many would have noticed that Maruti like the others is trying to go for a corporate face for all of its products, exception been the small ones. The bigger ones like the Kizashi, SX4, Swift Dzire, Grand Vitara and also the Swift look almost the same from the front. The side skirts at the sides made me feel as if I was driving a rally car or something. At the rear, expect for clear lens, nothing much has changed. Oh, the reverse light is now functional only on the left hand side of the car. This is a trend which actually started with the Fiat Punto car and now everyone seems to be getting on with it. The big “Bangle” boot is also the one and same. The tail pipe has a huge cladding over it and hence isn’t visible. The instrument panel of the Maruti Sx4 in India hasn’t changed much from the previous version and it still is the same tachometer to the left, speedo at the center and temperature, fuel gauges to the right. 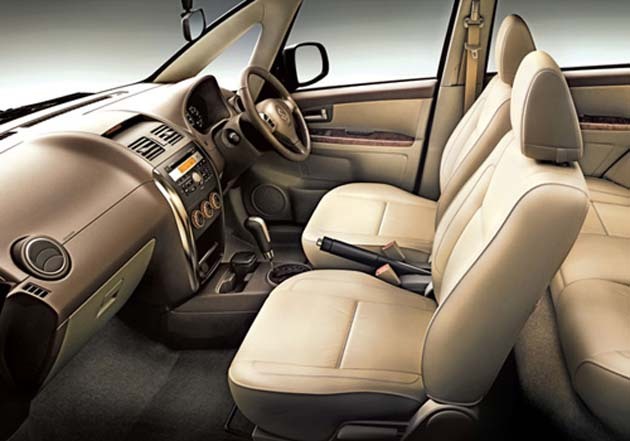 But then other things have changed including the now beige seats with leather as an option with the SX4 Royale variant. The interiors feel somewhat premium than the Ford Fiesta but not in front of its German competitors. There is automatic climate control as well as the dual din Kenwood audio system. Since I had all the time in the world to check out the features of this car, I played my favorite music from the AUX input. I could also pair my phone to sync with the car’s Bluetooth system. However one cannot attend calls or make one with the Bluetooth arrangement. Moreover the fonts of radio were small and in the irritating orange color. Been a 6 footer, for me, the driver’s seat was some kind of bother especially with the steering also playing spoil sport. But then finally making myself comfortable behind the wheel, I found that the SX4 is quite a tight fit for tall people. Made my colleague to sit in the seat and he been more of the horizontally spread ones, also had a hard time. But then ignore the discomfort for the time been and you would notice the 3 spoke steering wheel with audio controls on it. The mix of circular as well as rectangular AC vents do a good job of directing the air flow to the desired regions. Build quality is strictly okay and you notice the cost cutting around the steering region as well as quality of some plastics. At the rear, seating is better than in the front but then you sit a bit upright rather than be in a relaxed position. The transmission hump poses a problem for the middle passenger but then it isn’t so huge like the Kizashi. The door handles also don’t seem to enjoy the good build quality parameter. The boot space is big at 504 liters and it can easily help anyone while moving their house, bag and baggage. There are no suspension intrusions and also the loading bay is flat. The ground clearance that the Maruti SX4 in India claims over its rivals is 190 mm. This is enough to even put some of the so called utility vehicles to shame. Due to this ride height, I didn’t have to think twice before putting the car through some rough treatment, neither did I have to slow down for those big speed breakers. 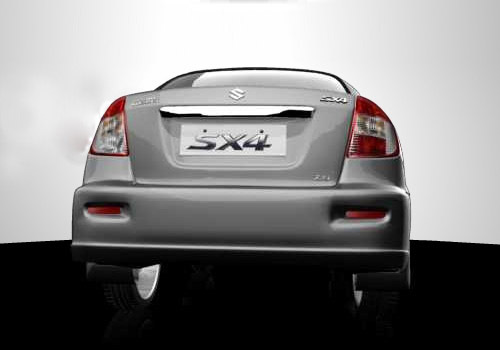 The SX4 is also stiffly sprung just like the Maruti Swift. This means low speed ride quality is a bit stiff but then the car doesn’t bottom out with a full load of passengers. The Anti Roll Bars and Independent Gas Filled with McPherson Struts at the front and Gas Filled Shock Absorbers with Semi Independent Torsion Beam at the rear ensures a decent ride quality. What it set out to achieve for itself, namely the handling of the Swift hatchback is intact. The steering feel is excellent and bested only by the Ford Fiesta in terms of feel. The SX4 boasts of a turning radius of 5.3 meters. This is marginally more than a small hatchback. But then reversing would take some time to master with that big boot hindering all view. Handling is tight and the SX4 would forgive you by allowing you to make last minute corrections. Sideways action is something which I enjoyed in the SX4. Give it the opposite lock and the car would be ready for some Gaurav Gill inspiring action. NVH is something which is on the higher side in this car. After some time, I actually started wondering if I was driving a petrol or diesel car. Go past 100 kmph and the car would have that roaring sound but not as refined as the Ivtec unit of the Honda. The rubber beadings around the doors are also single layered and this may be the reason as to why all those engine noise comes inside the cabin. During the recent face-lift, the Maruti SX4 in India also got VVT technology incorporated into its engine for better pickup, fuel efficiency as also complying to the norms. The power output has marginally increased but then it is the driveability which has gone up leaps and bounds. The 1.6 liter DOHC 16 valve engine now makes 104.68 Ps of peak power at 5600 rpm whereas the top torque of 145 Nm is generated at 4100 rpm. The transmission options are 5 speed manual and a 4 speed automatic. I had the opportunity to check out both the manual as well as auto option. Wish that the manual gear shifter was similar to the one in the Swift. The Swift’s gearshift mechanism is very smooth whereas that of the SX4’s feels somewhat notchy. Moreover, it has got long throws as well. Inspite of the VVT technology, the engine isn’t too eager to be revved. The 0-100 kmph run was blasted in 12.1 seconds whereas the top speed that I attained was 178 kmph. This figures were for the manual one but then for the automatic variant, the 0-100 kmph run was completed in 13.8 seconds and the top speed was 173 kmph. I usually don’t like automatics but then the SX4 made me rethink it as its auto variant is a far better buy than the clunky manual. The driveability is good and the gear ratios have been nicely spaced out. Braking is good but then it would have been better if Maruti Suzuki India Limited would have provided discs at the rear as well. The current pair of discs at the front and drums at the rear showed some brake fade after repeated hard braking attempts. Maruti has generously kitted the car with ABS as well as EBD. This also ensures that the car is always in control even when the going gets tough. Safety is one feature which has been amply taken care by twin air bags, 3 point seat belts with pretensioners, side impact beams and the collapsible steering column. Apart from these features, the car also comes with iCATS feature which is a security feature. Fuel efficiency of the earlier SX4 was widely criticized and Maruti have taken the right albeit small step to rectify this. The manual SX4 with careful driving in the city returned 11.4 kmpl in the city whereas the highway runs saw the figure climbing upto 15.7 kmpl. The automatic on the other hand boasted of 10.6 kmpl in the city and 14.1 kmpl on the highway. The Maruti SX4 in India is the replacement of the Maruti Baleno which incidentally didn’t do well. I remember writing in my previous article about the SX4 that it has to make do now with the scraps thrown by the Honda City. Inspite of the Honda been less on the VFM tag, people still buy it. But then the SX4 is something which cannot be ignored. If you live in India, you need to have a vehicle with good ground clearance, safety features, wide service network and good fuel efficiency. Apart from the last criteria, the SX4 ticks all the right boxes. Inspite of having the VVT tech under its hood, the car still isn’t a match to the stellar figures that the Honda City achieves. But then this car is way cheaper than the Honda and even offers more features. 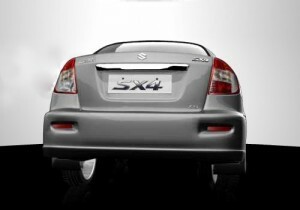 It has also got the Maruti brand tag to go with it and this means repairing a SX4 wouldn’t be a costly affair. The Maruti SX4 price in India starts from Rs 6,80,125 for the base version and moves to a lakh more for the topmost variant. There are 5 variants of this car and those are Vxi (base version), Zxi, Zxi automatic, Zxi manual with leather seats and the Zxi automatic with leather seats. Moreover, Maruti has launched a new CNG version of this car as well equipped with IGPi technology. As for me, I am waiting for the launch of the SX4 diesel. Let the car be a man or woman, I don’t care as long as it gives me the driving pleasure and be combined with an economical setup. Review of SX4 PETROL is an excellent one . My SX4 ZXI will be delivered in a week’s time . I will be back with a review by the end of the year . Regards to everyone . suzuki company is best company in the world. maruti is on of the fraud company inthe world. maruti suzuki swift has suzuki engine. maruti swift has local engine. there are two types of swift car. second is maruti swift, that is local car. this car has no suzuki engine. that is local or fake engine.there is no inprint suzuki name on the engine. if you have any dought please check your car engine.if your car engine suzuki ,that is original. you ask your dealer they also tell above said. maruti suzuki swift engine is import from japan. maruti swift engine is make from scrap material. maruti collect the scrap material from other car company like tata, fiat and they are making local engine. so dear friends don,t buy maruti swift. please buy maruti suzuki swift. please chech car engine is it suzuki engine or local or fake engine.